In 1994, the City of Seattle began to notice something wrong with trees in its urban forests. Research found that Seattle’s 2,500 acres of forested city parks were at risk from invasive plants such as English Ivy, Himalayan blackberry and bindweed. In 2004, experts predicted that 70 percent of Seattle’s forested parkland trees would be dead within 20 years. Meanwhile, a small but active group of park-goers was working to remove these invasive species on their own, while nonprofit organizations and a cross-agency team within Seattle city government also worked independently. Rather than helping the problem, however, these piecemeal efforts placed an undue strain on the city’s existing resources. 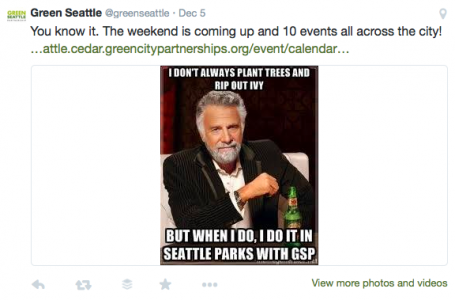 In 2004, the Green Seattle Partnership was formed with the aim of arming citizens to help the city’s trees in partnership with the Department of Parks, Department of Public Utilities and the Office of Sustainability and Environment. Under the leadership of Mark Mead, Senior Urban Forester at the Parks Department, the Partnership created a 20-year strategic plan to sustain Seattle’s forested parks. Green Seattle Partnership is now the largest urban forest restoration project in the country. Mark’s use of agents across all sectors connected to the issue, and mobilizing community members to volunteer 500,000 hours by 2013 to the reforestation program, have put the Green Seattle Partnership in place to achieve its goal of planting 500,000 new trees by 2025. Green Seattle Partnership successfully created a diverse program that unites community members, nonprofits and government departments to help save Seattle’s forested parks. The Partnership continues to secure the funding it needs from a wide range of businesses and uses over 10,000 volunteers and community workers annually. 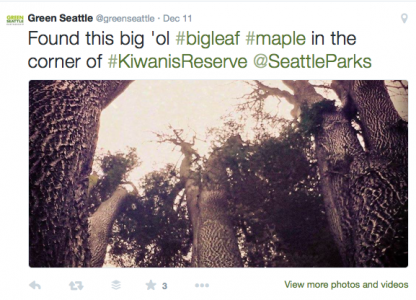 The success of the Green Seattle Partnership’s program has provided a template for a citywide Urban Forest Stewardship Plan adopted by the City Council and Mayor. In addition, the model and the Partnership’s strategies have been used in five other cities throughout Washington State to accomplish similar reforestation efforts. This remarkable collaboration provides a model not only for collaboration but also – we think – for engaging use of social media. Build support through shared resources. “Humanize” the organization by establishing a personality. In its Twitter presence, Green Seattle Partnership regularly posts updates on projects around the city, highlighting concrete success and engaging followers through engaging visuals of urban forests. 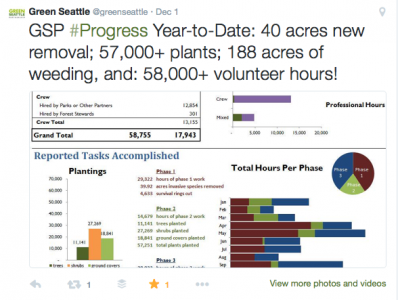 Green Seattle Partnership also excels at sharing resources through social media that build legitimacy and purpose and create context for the organization’s efforts. 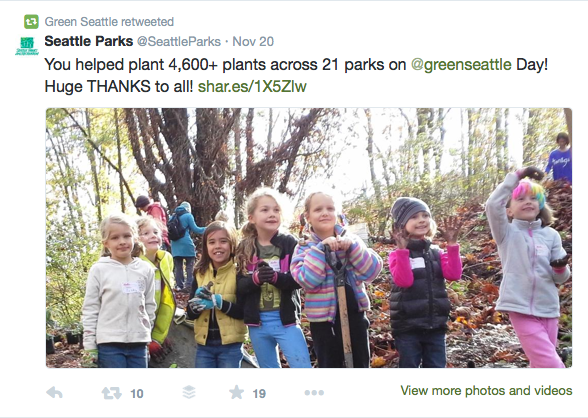 Green Seattle Partnership also uses social media to “humanize” its efforts and establish a personality. Learn more about Green Seattle Partnership on Twitter (@greenseattle), Facebook (Green Seattle Partnership) or Instagram (Green Seattle Partnership). Author: The Intersector Project is a 501(c)(3) nonprofit organization that seeks to empower practitioners in the business, government and nonprofit sectors to collaborate to solve problems that cannot be solved by one sector alone. We present real examples of collaborations in many places, across many issues and illuminate the tools that make them successful. The intersector is a space where government, business and nonprofit sectors share expertise, resources, and authority to address problems that cannot be solved by one sector alone.